There are many advantages to living in a golf community, and one of them is how much younger and full of energy you can feel when playing the sport. Most people think of running, going to the gym or cycling as a means of keeping fit, but golf also provides health benefits with less impact, making it an ideal form of exercise for the older person. It is gentle on the body and the chance of an injury is rare. If a player carries his or her golf clubs or pulls them on a hand cart, this will give his heart an extra endurance test and should help him keep fit and lose weight, a better way to reduce BMI (Body Mass Index) than fad diets that typically do not work. Losing weight can relieve pressure on the joints, making that walk around the golf course even easier; reduce the chance of arthritis; and cut the risk of diabetes. The exercise aspect of a round of golf can also improve respiratory and vascular functions. Golf can help improve muscle tone and help players keep a better, more attractive shape. They might even have others thinking they look younger than they are. Improved muscle tone also means enhanced balance that, in turn, will reduce the chance of falls. Falls are the number one reason for visits to the Emergency Room by people aged 65 and over. And as anyone who plays golf regularly knows, balance is an integral part of the successful golf swing. The physical exercise of playing golf triggers the production of endorphins, the body’s natural pain reliever that is impressively 30 times stronger than morphine. (This will help ward off aches and pains and give a sense of wellbeing that protects against stress. Exercise also is fundamental to the production of glucosamine, a substance that is involved in lubricating the joints so that they glide smoothly. More glucosamine means more agility and less risk of arthritis when older. Getting involved in golf for the first time brings with it a new community and group of friends to expand a person’s social circle. Golf is a universally popular sport, played by more than 50 million people in 206 countries; therefore, there are always lots of different people to meet. A good social circle promotes good emotional health, and that can even increase life span. The University of North Carolina reviewed 148 studies of health outcomes and social relationships and found that people with few social connections had a 50% higher chance of dying during the study follow-up period of seven years, compared with people who had the most friendships. The difference was so extreme that some researchers have declared social isolation to be as damaging to health as cigarette smoking or other harmful addictions. Due to this and the physical and mental benefits of golf, including the possibility of longer lives, doctors are encouraging more people to take up golf. Six million of the golfers in America are over the age of 50 and, with age comes health concerns. One of the most common ones is osteoarthritis, or ‘wear and tear’ arthritis of the joints. As the protective cushions between the joints wear out, bone can scrape on bone, causing pain and stiffness and reducing range of movement. Joint replacements are typically done in advanced cases. Of course, those golfers who must have a joint replacement always wonder how quickly they can resume playing the game, if at all. The good news is that golf is still good for people post-operatively. In a survey of the Hip Society, no surgeons prohibited their patients from playing golf and none reported any complications from resuming the game. 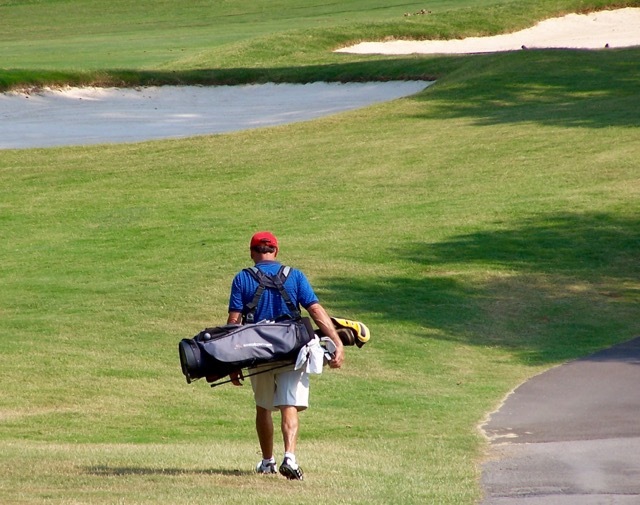 Seven in 10 surgeons advised precautions such as using a cart while playing and waiting at least four months after surgery to resume golf, but with the proper guidelines more than 90% could enjoy the sport without any discomfort and still continue to enjoy all the recognized health benefits. Anne Foy is a freelance writer and mother. She turned to writing as a more flexible career that complements parenthood. In her spare time she likes to follow sports and go for walks with her three standard poodles. I spent a very pleasant five days at a friend’s huge rented home on the beach at Kill Devil Hills, NC, on the Outer Banks, known locally to all as the OBX. (All residents’ license plates appear to begin with the letters OBX.) Kill Devil Hills is famous as the launching pad for the Wright Brothers’ first flight. I visited the Memorial to the events of December 17, 1903, just a mile from where we were staying, and it was a brief but impressive look at the dawn of aviation. Stone markers denote the distances of the flights on that fateful December day in 1903, a few dozen feet for the first three and then one giant glide for mankind on the fourth attempt, just over 850 feet in 59 seconds. A large granite monument atop the highest hill on the Outer Banks looks down on what was once a sandy runway and is now totally grassed over. 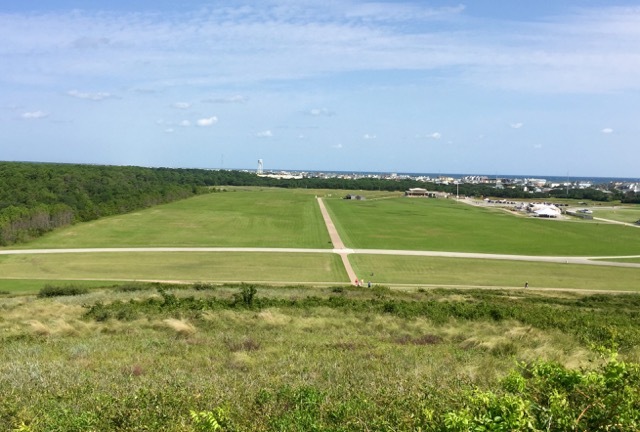 On December 17, 1903, the Wright Brothers flew a plane for nearly one minute at a distance of 852 feet, in the field below. It was a field of sand at the time. The OBX attracts vacationers for much more than its history. The beaches stretch many miles along the Atlantic, and Kill Devil Hills, Kitty Hawk, Nags Head, Duck and the other towns that dot the banks exhibit all the perquisites of beach resorts, such as many seafood restaurants and other entertainment venues. (My most notable culinary find of the week was at Duck Donuts, a local chain that makes hot donuts all day long and dips them in whatever sugar component you’d like; the maple bacon donuts were terrific). During the rest of the day, the main attraction is the beach. The children in the Carolinas had just returned to school before our week and not every home seemed to be rented at ocean side and traffic was quite manageable, unlike just a week earlier. 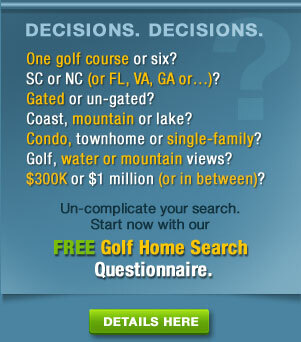 The Outer Banks is not especially noted for its golf courses, although it is certainly not lacking. Seascape, a course I played for the first and only time in 1971, once sported unimpeded views to the ocean from its perch up on the dunes, but today homes impede those views and the course conditions are less than optimal. 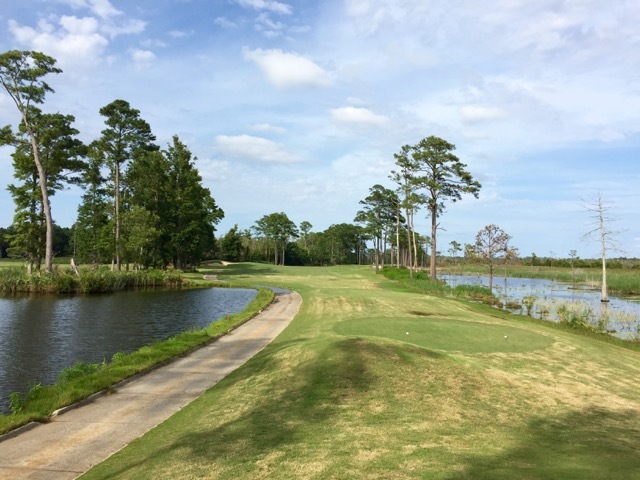 The Currituck Club, surrounded by single-family homes and condos, offers some nice views of the Atlantic and a few good holes, but some complain about the price of green fees outstripping the quality of the experience. I and a few of my housemates for the week played at Kilmarlic Golf Club, a course just 20 minutes from Kill Devil Hills; it was in splendid condition except for the pockmarks on the greens that are the bane of resort-area courses. (Interloper players, with no vested interest in the future of the golf course, tend not to make the honorable effort to repair their pitch marks.) Kilmarlic, which I first visited nearly seven years ago (see review here), has seen some significant growth in the number of homes at its perimeter, none of which encroach on the layout. 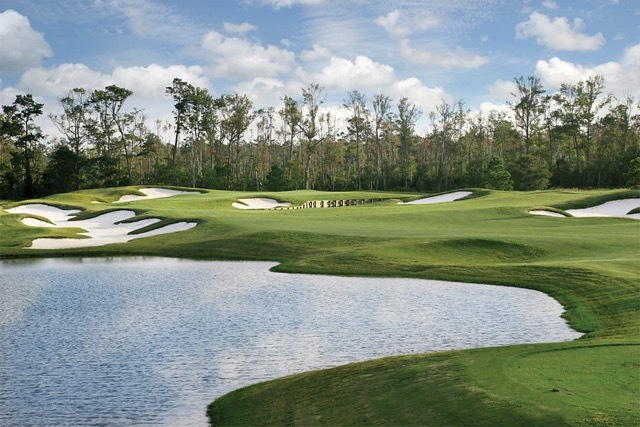 The course, which plays host to a major collegiate golf event every year, was designed by Tom Steele, not a noted architect but one who put together a noteworthy routing that is both fair to the average golfer but with enough in the way of challenges -– elevated greens, marshland surrounds, well-placed bunkers that hide the bottoms of pins -– to give pause to the single-digit handicap player. Kilmarlic may be a few miles from the beach, but there is plenty of water on the course, some in play, some ornamental. Just four miles over the bridge to Kitty Hawk, Kilmarlic and the town of Powell’s Point are well located away from the summer traffic yet within 10 to 15 minutes of the beaches. 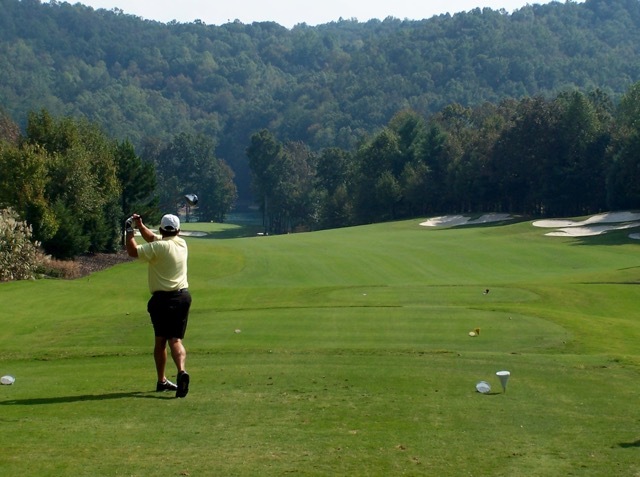 Although the community of Kilmarlic was developed separately from the golf course, it offers most of the amenities of any larger sized golf community. (The Kilmarlic neighborhood is 650 acres in size.) Homes start in the $400s, fairly priced especially for those looking for a year round vacation spot separated by a few miles from outstanding beaches. My week in Scotland ended Saturday after some last-minute shopping in Edinburgh and a walk through one of the many venues at the annual Edinburgh Fringe Festival, a celebration of the arts, especially those at the "fringes" (including comedy, theater, art exhibits and music). The festival started as I arrived 10 days ago and, as advertised, there were mobs of people in town for the many shows and associated activities. Norwegian Air, the highly successful discount European airline, started service earlier this year from Hartford, CT, 35 minutes from my home, non-stop to Edinburgh. The fact that I did not have to hassle a drive to either Boston or New York, more than two hours away, to catch a non-stop flight to Scotland was just one of the benefits of the service; Norwegian's introductory fare of $99 to Edinburgh was too good to pass up, even though everything, including taking your bags along with you, costs extra, as does the return flight, which runs about three times more. Still, less than $500 roundtrip from an airport so close to home to an airport in the middle of the best region for golf in the world seemed like a godsend...that is, until you actually fly Norwegian. The seats are narrow, and on the way to Edinburgh, my elbow fought with my neighbor's elbow for space on the armrest between us. The seatback reclined maybe three degrees or so, making sleep on the overnight trip to Edinburgh impossible. (My neighbor's snoring, as he rested his head on his tray table only added to the insult.) The meal that came with the upgrade in service to include a checked bag was typical of airline food, which is to say overcooked to make sure they don't poison their patrons (or give them a single pleasurable chew). On the plus side, the flight to Edinburgh was 50 minutes earlier than scheduled, and the flight back to Connecticut just a few minutes late. Customs and immigration at both ends was pretty routine. In the end, there was little pleasure in the six-hour plus flights, except the knowledge of how much money you save flying Norwegian. In line to check in for the return flight from Edinburgh, I met a couple from Ohio who had driven eight hours to the airport in Newburgh, NY, just to catch a Norwegian flight to Edinburgh. Flights from Cleveland and Pittsburgh, both less than two hours from their home, were priced four to five times more than from Newburgh. I mostly had good to very good meals out. Thursday night's meal in St. Andrews at a place called the Dolls House was good, and fairly priced for the quality of the food ("starters," or appetizers, averaged the equivalent of $11 and entrees ran an average $25). St. Andrews, which will be humming when all the students attending the university arrive in a week or two, was quiet, but the Doll's House was not, obviously popular with or without students in town. I had another nice meal during the week, with more about the atmosphere than the food, at The Haven restaurant in the tiny coastal town of Cellardyke. Getting there was a white-knuckle experience since The Haven is on a narrow street -- more like a lane -- which you get to by driving down other narrow lanes. I parked on the sidewalk just down the street from the restaurant making sure I left enough room between the front of the car and the doorways of the homes that open directly onto the street. My table in one of the house’s small dining rooms had a nice, but slightly obstructed view of the coastline. The pork chop I ordered at The Haven tasted funny, although it was beautifully cooked, and since I didn't take ill later, I assume that Scottish pigs taste different than American-bred pigs. My best meal of the week was a filling lunch in the tiny clubhouse of Anstruther Golf Club, just down the coast from where I was staying in Crail. The Rockies restaurant, named for one of the holes on the old nine hole course, is separated into two parts -- one for members of the club and the other for members of the public. The members' side early on a Monday afternoon was mostly full; because of the quality of the cooking, the restaurant does a big business in a small town. I ordered the three-course prix fixe lunch and the waitress kindly permitted me to substitute a second starter in place of dessert. What she called a sweet corn chowder was really a stunning smoked fish stew, the fish most likely haddock, with a few bits of potato and corn nestled in the creamy, smoky soup. It ranks up there with the best soup I have ever had. The sea bass on a pea risotto was perfectly cooked, but after the soup, it was almost anti-climactic. The other starter, a chicken pate, was tasty and perfectly complemented with a jam and crackers but a little too runny for my taste. The three courses came to around $26. Choose wisely in the Kingdom of Fife and you can put together a week's worth of excellent meals at fair prices. One last note for anyone who travels by themselves to Scotland. I drove 25 minutes to a well-reviewed steakhouse restaurant outside Edinburgh thinking that, even without a reservation, I could eat at the bar. “Sorry, sir,” said the hostess. “Food is not served at the bar.” Come to think of it, I don’t know that I have ever been in a pub or restaurant where the patrons did anything but drink at the bar. Lesson learned. Having only driven once in Scotland, back in 2008 and with limited comfort, I was intimidated at the prospect of getting out of the car rental lot at Edinburgh Airport without incident and making it to one of the main roads on the way north to Crail. I had the benefit of spending a few days in London immediately upon arriving in the UK, and I tried to train my brain for the other side of the road as I drove around the city in the passenger seat of my brother in law's car. I guess it worked because, aside from scraping into just a few curbs -- always on the left side of the car -- I became quite comfortable on the roads in Fife, even on those narrow village streets. The road courtesy among the area's citizens is something to behold, and even when the passageway is less than two car widths wide, all drivers will find a little notch in the sidewalk, wait behind a row of parked cars or take advantage of one of the many strategically places "passing places" set up along one-lane roads (such as those that serve as entrances to the golf courses). I wouldn't hesitate to drive in Scotland on a future golf holiday. Lost and Found: I could not find my way to return my rental car at Edinburgh airport. But a kind shuttle driver at a competing rental place pointed me in the right direction just as a rainbow appeared. 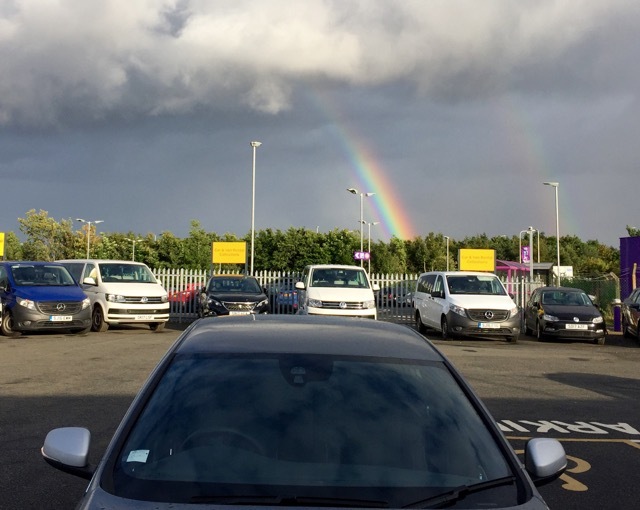 Alas, there was no pot of gold at the end of this rainbow, as the rental agency charged me for a crack in the front bumper. Earlier this year, I joined the Crail Golfing Society and its two wonderful golf courses as an “overseas member.” (I’ll make the case for membership and even a second home in Crail in an article soon.) That provides me with eight rounds each annually on the Balcomie Links and Craighead courses, plus the ability to bring guests for just £15 each (about $22), free golf at a number of golf courses in the Kingdom of Fife (e.g. Blairgowrie and its three layouts) and deeply discounted fees at some of the best courses in the area, including Ladybank. Crail membership also means access as a member to the centrally located Royal Overseas League facilities in Edinburgh, whose rooms overlook the famous Edinburgh Castle. The ROSL could come in handy on any future trips that necessitate a stay over in the city before or after golf in Crail, which is just a 75-minute car ride from Edinburgh. From the 17th tee at Crail Balcomie Links looking out to the North Sea. The finishing hole, a par 3, is on the left, below the clubhouse. The walk to the clubhouse from the the 18th green is, by far, the steepest of the round. I was lucky with the weather, getting rained out of only one round early in the week. (I could have joined the bundled up hearty Scots who headed to the first tee, but why torture myself on vacation? I still had more days to play.) Tuesday through Friday, I encountered rain on maybe three holes, none of it particularly heavy. The Balcomie Links course is everything you imagine about Scottish links golf; very tight lies in the fairways, the ability to putt from up to 20 yards off the green (I successfully negotiated a 30-yard putt mostly because my chipping game was awful) and winds so fierce at times that you have to remind yourself constantly that swinging harder does not result in a longer drive into the wind; on the contrary, it can ruin your swing for the rest of the round. The course was in splendid condition, which is to say never a bad lie, unless you find one of the few gorse bushes on the course or one of the many pot bunkers that, almost weirdly, didn’t seem to be in play from the 5,861 yard tees (those are the back tees, by the way, at a par of 69, a rating of 69.7 and a slope of 122). But don’t believe those rather wimpy numbers; the raters must have scoped out the course on a rare windless day. Virtually every hole on Crail's Craighead golf course is in view of the North Sea. Here, at the 10th green on the short par 4, I had my best opportunity for birdie. I missed the six foot putt, no doubt distracted by the views. 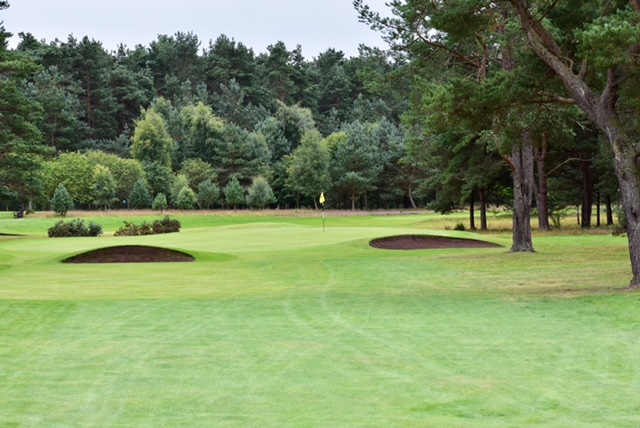 Craighead, more than 100 years younger than Balcomie, was designed by Gil Hanse in 1998 and is a little less forgiving than its partner course, with plenty of tall grasses and heather to catch errant drives, whereas Balcomie is a bit more open, even though there are few trees on either course. The North Sea is in view from virtually every hole on Craighead and, of course, the wind can play havoc with most shots. This is one of the reasons that the greens are a little on the slow side on both courses; if they ran above 9 on the stimpmeter, it would be difficult to keep a ball from moving from its marked spot. At 6,651 yards from its back tees, Craighead is much longer than Balcomie and makes up for it with a par of 72. One memorable two-hole feature on the Craighead course is the wall immediately behind #10 green and then a wall that runs across the fairway on the par 4 11th, just 210 yards from the green and making all but the top of the flag impossible to see. Golf professionals and their staffs in Scotland could not be more accommodating to visitors. Apparently, if you book a tee time as a single, you are permitted to play as a single, even if the course has other golfers waiting. While I was waiting to tee off at Crail Balcomie, the assistant pro sheepishly approached and asked if I minded being paired with two other golfers. On the contrary, I preferred it since playing as a single behind a foursome would make the round seem way longer than it was. I had a delightful day with a father and son from Spain. It is views like this, of the 16th green at Balcomie Links, that will keep me coming back to Crail. My day at Ladybank was pretty much settled after a slightly pushed hybrid into the wind on the par 3 10th, where I started my round Friday. I was looking forward to playing a highly rated Scottish parkland course to see how it stacked up against some of the Connecticut courses I have played that were designed by UK designers (e.g. Willie Park). Off that initial shot, my ball wound up on the far side of the greenside bunker, on the upslope (photo attached). The sand was the deepest and darkest I have ever played, a mud brown that was offputting. I left the first shot in the bunker, skyed the next one over the green and started my mediocre round with a double bogey. From the tee, it appeared I would have a routine bunker shot from the greenside bunker at Ladybank Golf Club's 10th hole. It was anything but. Those brown bunkers are in great evidence at Ladybank, nasty buggers that guard virtually all of the greens and some of the fairways. My playing partner for the day, Mario from north of Quebec City, joined me for the second nine and my cautions about the bunkers may have intimidated him on his first play from the sand. He didn't take much sand in the greenside bunker and wound up 10 yards beyond the green. Most of my plays from the sand during the day were chunks. Ladybank is a handsome course with a few really interesting holes. I especially liked the three doglegs and the par 3s, despite my tussle with #10. There is a repetitive nature to the bunkering in that most of them are more or less the same size; after playing the two linkslike courses at Crail, it was a bit of a surprise not to find any round pot bunkers at Ladybank (at least none that were apparent). Only the 9th hole, one of the doglegs, was absent any bunkers guarding the green. Instead, a large ridge of deep grass spanned the fairway 75 yards from the green. It was one of my favorite holes of the day, in large measure because it was unique to the layout. The 9th green at Ladybank is the only one without bunker protection. Instead, a ridge of thick grass guards the area 75 yards in front of the green. Like Crail Balcomie Links, Ladybank is the handiwork of Old Tom Morris...sort of. Morris laid out the first six holes in 1879, a half dozen years before Crail Balcomie opened. I am not sure which six holes he laid out, or if they have survived in more or less their original form, but if they did, it is hard to detect the hand of the same architect at both courses. Of course, the landforms -- one pure links land the other park land -- determine the layout of the course according to the master architects. In retrospect, you shouldn't expect to see any similarities at all. One side note: From the pro shop member at the desk to the staff working out on the course to wait staff in the clubhouse restaurant -- great baguette sandwich, by the way -- to even the golfers waiting to go to the first tee, everyone at Ladybank could not have been nicer. In fact you could say that about every course I have played in this golf crazy nation. The bunkering around the par 3 8th hole at Ladybank is reflective of the serious protection of the greens on the golf course. The Scots have been at the game of golf for centuries, and it shows in many ways American golfers are pleased to encounter when they visit. Gas and electric carts, or "buggies," are not much in evidence; indeed you would not know they exist at most Scottish courses and you need to reserve one in advance to guarantee availability. It is almost as if Scottish golf professionals prefer not to tempt visiting golfers and, therefore, keep the buggies hidden away nearby. I carried a note from my doctor in the States just in case I needed one, but with a battery powered hand cart on rental at many clubs, there really is no excuse for avoiding a good walk. The way the Scots handicap their individual holes is entirely different than in the States, and much more rational. 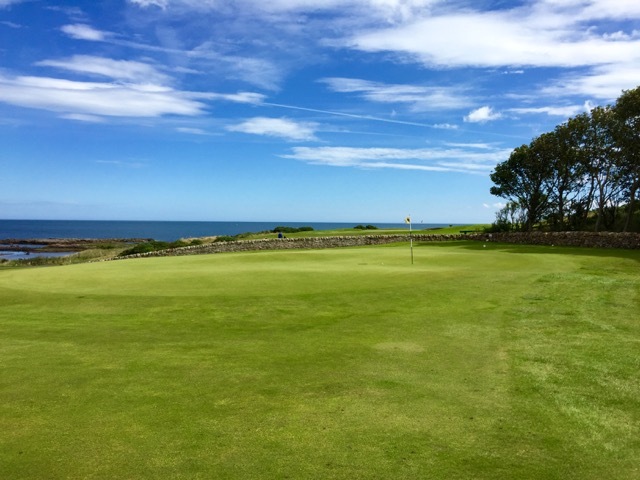 Using my round at the Craighead course at Crail Golfing Society yesterday as an example, it is evident that Scottish raters are not slaves to distance when deciding which holes are toughest and easiest. Whereas in the U.S. there appears to be a bias against par 3s -- they are short therefore they don't offer the opportunity for mistakes that, say, a par 5 does -- the Scots look purely at the difficulty of the hole against par. One other touch I found helpful and generous was at the practice range at Crail, where distances to colored posts in the practice ground are clearly marked at the tees. Especially for a visiting American for whom the air might be a bit thinner than in some parts of the States or the prevailing winds may have a novel effect on balls in flight -- they do, trust me -- being prepared at the range can help save a stroke or two on the courses at Crail. Too many times in the U.S., the tees are moved forward and back at the practice range without noting the change in the distances. Of course, at Crail, you hit off mats at the range and, therefore, they never have to move. Okay, score one for the American clubs. 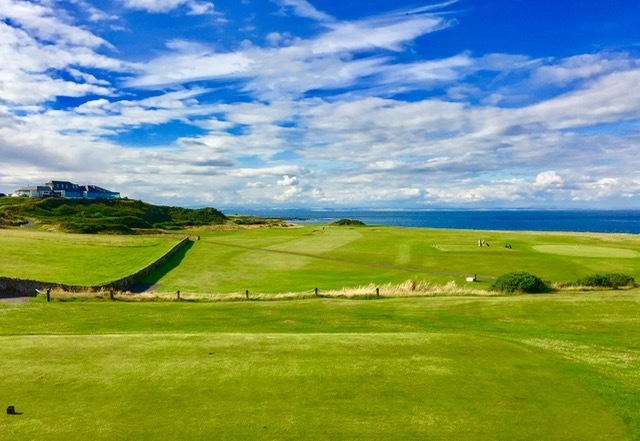 These reports from my golf vacation in Scotland may seem a bit self-indulgent, but my hope is that those who might be planning a trip here can glean a few helpful suggestions from my experience. I know I'm a bit off topic -- I haven't written yet about golf real estate in Scotland -- but I do plan to make a case for joining a Scottish golf club, even if you plan only a one- or two-week trip annually to play golf here. If you would like to share your own experiences playing golf in Scotland, please contact me and I will be happy to share your thoughts here. If the British had won the Revolutionary War, I suppose we Americans might be driving on the left side of the road and playing golf in all sorts of nasty weather. This occurred to me today as I drove my rental car on the "wrong side of the road" the 45 minutes from Crail to Ladybank Golf Course in a steady rain. The width of the roads in Scotland change like the weather here, which is to say often and without warning, and my only challenge on the roadways has been to avoid the curbs on the far side of the car. I expect the rental company might charge me for a new pair of tires on the left side when I drop the car off Friday. Despite that you can experience three seasons in one hour along the east coast of Scotland, where I am staying (it doesn't snow in August, although there are times it feels as if it could), the online weather reports saw today's steady rain coming five days off. Still, hoping against hope, and with a pre-paid reservation, I headed for Ladybank. My hopes were dashed when I arrived and scooted through the rain to the pro shop, hoping the golf professional might offer a brighter outlook for later in the morning. He didn't but kindly changed my reservation to Friday morning before I return to Edinburgh for the flight back to the States. In another corner of the pro shop, a foursome of Americans were not quite as decisive as I was and were in heated discussion about whether to give it a go or not. As we five Americans moaned about our fate, an old bearded guy right out of central casting for Old Tom Morris, the famed 19th Century Scottish golfer, pushed past us all and headed for the first tee, head down and wearing enough rain gear for two players. He seemed happy to be ready to take on Ladybank's 6,300 yards, its distance from the forward men's tees, as well as the elements. As I walked to the parking lot to leave, the Americans continued their debate about what to do. It was even money whether they played or headed for a tour of one of the Scotch distilleries in the areas. course seem to play very long. In uncharacteristically benign conditions on Sunday -- benign meaning it only rained during one hole and the wind blew at no more than 15 miles per hour -- I played my initial round at Crail Golfing Society's Balcomie Links with my good friends and hosts, George and Dorothy. It was an unusual day for Crail in that the Scottish Boys and Girls Amateur Championship is being played on the course and cars were parked beside the practice range. (I was pointed to the Members parking lot as I recently joined the club as an Overseas Member, but more about that in the coming days.) The clubhouse and practice areas were also filled with players under 14 years old and their families. The other Crail golf course, the modern Craighead, is the site for the event which begins today and ends tommorrow. I didn't count them all up, but the massive scoreboard in front of the clubhouse seemed to contain well over 100 names. And I heard as much Spanish, German and French as I did English spoken by the kids and their parents; this is an "open" championship and obviously an important pan-European event. Although Crail Balcomie Links, opened on its current site in 1985, cannot lay claim to being one of the oldest courses in the world, the Crail Golfing Society can, formed as it was in 1786, number seven on the list of oldest clubs in the world. Old Tom Morris designed Balcomie and, 113 years later, Gil Hanse laid out Craighead on the south side of the clubhouse. Like Balcomie, it too sports stunner views of the North Sea and, on clear days, you can spot the land that spreads east along the Firth of Forth from Edinburgh and comprises the golf course at Musselburgh, the oldest layout in the world (and, sadly, overshadowed and over-invested in by the adjacent Musselburgh Race Course). The famed Muirfield and North Berwick layouts are over in that direction as well. Tomorrow morning I return to Balcomie for another go. I am hoping for a return to dry conditions, and right now the online weather report calls for no rain at the start of my round and for about four hours. Since a typical round at Crail takes about 3 hours and 40 minutes without golf carts -- the hand carts, blessedly, are motorized -- I could get lucky. But to reverse paraphrase what Mark Twain wrote about Connecticut, "If you like the weather, wait a minute. It will change." I am in the United Kingdom on a golf holiday and, with apologies, will continue to file reports here. I am hopeful that some of my "stories" will provide a bit of guidance to those planning a golf venture to Scotland. Although I have made the trip before, it has seemed much easier in the past. I spent the better part of Wednesday through Friday visiting with my sister and her family in London and meeting, in person for the first time, my grand niece. The playground in West Hampstead where we took her and her sister was like nothing I've seen in the States in that it is maintained by the organizers of a group home next door who planted and tend to vegetable patches. My nieces picked a couple of tomatoes (to-mahhh-toes) but no one, according to my brother in law, abuses the privilege. Take a corn, cucumber, zucchini or whatever and leave plenty for others. Very civilized. Getting out of London to return to Edinburgh, Scotland, was almost frightening. I chose Luton airport for the flight on Easyjet, one of Europe's discount airlines. The flight wasn't the problem; the airport was. Lesson learned: On a summer Friday in early evening, with people intent on heading for holiday for a weekend or week, most British airports are madhouses, this one more so than others. It is an old airport, poorly organized in terms of layout and flight announcements. The board announced that the gate for my flight would not be called until 1/2 hour before departure time. (Many other flights indicated the same thing.). Yet my ticket indicated that the gate for the Easyjet flight would be closed 1/2 hour before its scheduled departure. Making matters a bit more intimidating, the gate areas were split, one off the left from the main terminal and the other to the right. Signs posted indicated the walk to some gates were as long as 15 minutes. People were jammed into all nooks and crannies of the terminal, and some of the workers trying to replenish shelves with sandwiches in the shops had to excuse themselves repeatedly to get their carts through. And, yet, not a single-person raised his or her voice or seemed at all angry about the delays and the steerage-like conditions. The next morning, in a trailer in a parking lot near the hotel, I rented a car from Fox Rent-A-Car. At least I tried to rent a car. The line at the desk was about 10 customers long and there was just one frazzled attendant. His profuse apologies did not seem to mollify some of the customers, and after 15 minutes, I was only two customers closer. A reinforcement arrived and helped shorten the queue (important British term there) and my paperwork was done after 45 minutes. In the drizzle I waited, along with six others, for my car to be delivered. And waited. And waited. More than a half hour later, my name was finally called, the only compensating factor being the brand new Volvo now in my possession for the week. The drive north to Crail "on the wrong side of the road" was surprisingly easy, although I could not quite figure out the distance from the left side of the car to the edge of the roadway. Fortunately, no tire-damaging curbs were in play. In summary, my advice is don't fly from Luton Airport outside of London on a Friday night in summer; choose the better organized Heathrow or even London City Airport. Take nothing for granted when booking a hotel or renting a car in Edinburgh; ask a lot of questions beforehand (and consider renting the car from one the big three, like Hertz or National.). Bring proper rain gear if you intend to play golf every day while in Scotland; the weather can change dramatically day to day, even minute to minute. (I experienced four seasons in 15 minutes at St. Andrews in 2009.). I may have more to say about this after my round tomorrow (see below). I am now with my dear friends in Crail, 1 1/2 hours north of Edinburgh, anticipating my first round of golf in a couple of hours at Crail Balcomie links, the 7th oldest golf course in the world. It is a brilliant sunny day -- for now -- and I can't wait to renew my acquaintance with this terrific links course beside the North Sea. Tomorrow will be a different experience at a parkland course called Ladybank, a half hour away, with the weather expected to be dark, dreary and very wet. I am fairly well prepared with water rejecting pants -- not quite Goretex -- and a repellant overshirt. I'm fine with drizzle but if it comes down hard, I may consider what any serious tourist might under similar conditions -- head for a whiskey distillery for a tour and a wee dram. Stay tuned. I don't sleep well on airplanes -- or at all. And when the plane is as crowded as Norwegian Flight 1609 from Hartford Bradley International to Edinburgh was yesterday, in both numbers of passengers and configuration of the seats, no sleep is guaranteed. When the price is more than right for an international flight like the Bradley to Edinburgh non-stop flight, you know you are going to pay the piper in one way or another. I scooped up a fare of just $99 for the U.S. to Scotland leg and paid an extra $75 for one checked piece of luggage and a meal in flight. My bag arrived shortly after I did but the meal of undercooked green beans and overcooked chicken certainly was no bargain. Neither is the return flight from Edinburgh which, pre-paid at $300, includes the bag and meal. That's about half of what a roundtrip flight on one of the other trans-Atlantic carriers costs, but none of them fly non-stop from Bradley, just a half hour from my home in Connecticut, to Edinburgh. The cost and headache to get to Boston or New York convinced me to try Norwegian. There is always a balance between price and service. The Boeing 737-800 aircraft with three seats across on both sides of the plane made it impossible to even attempt to sleep. The seats reclined about three inches, meaning the seatbacks at full recline were virtually upright. And the narrowness of the seats themselves meant the guy in the seat to my right and I were vying for elbow space on the handrest most of the trip. He was a bit more aggressive than I was. He also snored and could not make up his mind whether to lean his head on the drop down table in front of him or try to lean back on the barely reclined seat back. His efforts were distracting. I have one other gripe with Norwegian. When I booked my flight, I thought I would bring my golf clubs with me. 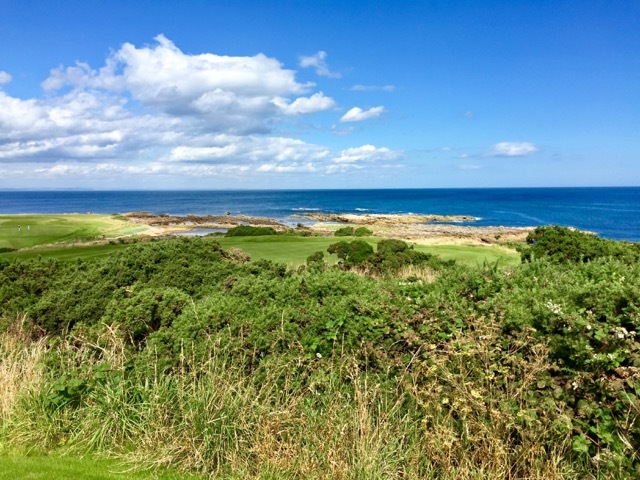 But 10 days before the flight, I decided to ship them straight to my golf club destination at the Crail Golfing Society, where I have become an overseas member. I called Norwegian a week before my flight and alerted them that my pre-paid clubs would not be flying over with me and asked for a refund or credit. Not permitted, they said. That $99 fare includes zero flexibility. On the plus side, the plane arrived in Edinburgh 50 minutes early and customs was farily easy to get through, maybe a total of 30 minutes. I was surprised that after I collected my bags I did not see a single customs agent. Perhaps they trust the X-ray machines in the U.S. to do the job of spotting bad stuff in luggage, but this was a first time for me that there was no cutoms presence. There is a convenient shuttle at the airport into the center of Edinburgh and stops along the way. I was going to take a train to London to see my sister and her family there for a few days before proceeding to Crail for a week of golf. The shuttle service is called Airlink and it is just about $6.00 for the one-way trip, and comparatively cheaper for a round trip. Again, cheap is relative; on the way into the city, a female pedestrian tried to beat the bus at a traffic signal. She didn't quite make it. The driver slammed on the brakes in time but the woman went arse over tea kettle in the road. She picked herself up, grabbed both sides of her head more in frustration, it seemed, than in injury, and ambled off. The young bus driver was shaken. He called his supervisor who advised him to move the bus to a side road, park it there and dismiss his passengers from the bus. The driver advised that I was only "two stops" from Waverley Train station and that I could walk it in 10 to 15 minutes. It might have been a pleasant walk without the three pieces of luggage, but the big one has four wheels which at least made it doable. But by the time I made it to Waverley Station, I almost felt as if I had been hit by a bus. Once at the train station, the odyssey continued. I tried to secure an earlier train but it turned out that the firm I pre-bought the ticket from, Rail Europe, a North American based company, does not have agents in Edinburgh station. I decided to wait for my original train, scheduled at 1:30 which, around 1:00, was cancelled. I was able to snag a reservation for the 2:00 train. When two British citizens, one from Scotland and one from England, sat down with me at my table, we started talking as the train left the station. When I realized they could take a joke, I warned them that they might want to change their seats because my luck was running ice cold over recent hours. Not one minute after I warned them, the train came to a halt and the conductor came on the PA system to say there was an obstruction on the rail line ahead -- "probably a cow," my new Scots friend said. I wound up arriving 35 minutes late in London, where it was pouring rain. Hartsbourne Country Club is home to a classic golf course with some modern flourishes. On a more positive note, I was invited to play at Hartsbourne Country Club just outside London today, and it was an uncharacteristally glorious sunny and cool day in the often wet London summer. The course was in excellent condition, it was a convivial round with two friends and my brother in law (he's my friend too), we stopped for a genteel lunch in the centuries old clubhouse (hideaway place, I am told, for one of the former Edwardian kings and his mistresses), and had a relaxing post-game beer in the same dining room. 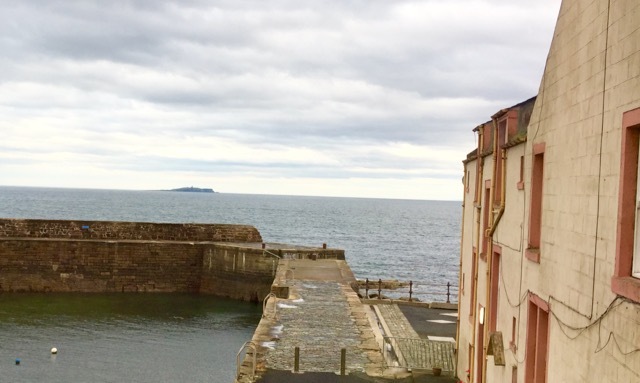 It made me almost forget the disaster of the previous day's travels and caused me to look forward even more to my week in Crail, which begins on Saturday. I can only hope that the weather forecast in Scotland, which calls for rain half the time I will be there, is wrong. More to come. Maybe it is a sign of the times, but when I receive good customer service these days -– you know, suppliers doing what suppliers say they are going to do –- I find it extraordinary. That happened on a recent trip to the Dominican Republic when I was stuck at the steaming hot Punta Cana airport waiting for my daughter and her boyfriend to arrive from Toronto on a delayed flight. The young man running the desk for the Amstar shuttle service not only volunteered to send my wife, son and his girlfriend to the resort early, but he loaned me his portable wi-fi unit (without my asking) to amuse myself on my iPhone for a couple of hours and then drove me to the other terminal to meet my daughter’s plane, assigning another staff member to wait with me. My good streak continued today when, within minutes of each other, I heard from the membership director at Crail Golfing Society in Scotland that my clubs had arrived, and then from a staffer at Luggage Forward, the shipper, to tell me the same. Luggage Forward deserves special praise for its efficient process, follow-through and delivering more than it promised. Last Tuesday, I contacted them about sending my clubs to Crail in advance of a week of golf there that begins August 12. The next day I received an envelope with a bag tag and customs forms and, as promised, the following day a DHL employee came to the house to pick up the clubs. I was guaranteed delivery by next Friday, August 11. The clubs arrived today, August 7. Given that kind of service, Luggage Forward will be shipping my clubs in the future when I travel for golf. 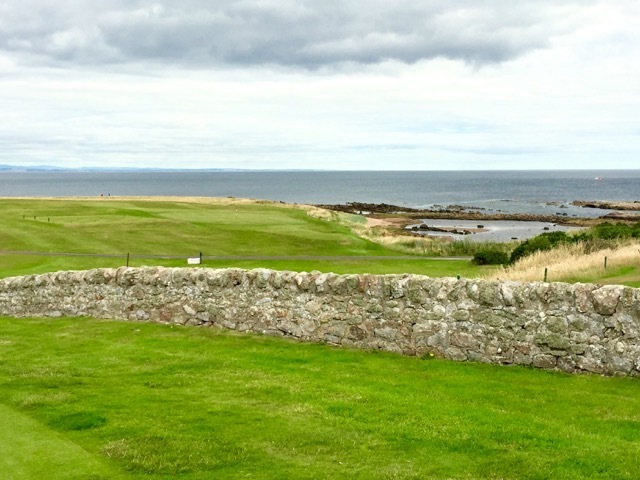 Old stone walls and the North Sea are a constant presence on both 18 hole layouts at the Crail Golfing Society. It may seem pricey, but the $244 door-to-door shipping charge turned out to be reasonable. These days the airlines charge as much as $75 for a golf bag and because I was going to take a side-trip to London from Edinburgh before returning to drive to Crail, I wasn’t going to drag my clubs to London with me. Storage fees at Edinburgh airport for a golf bag are £20 per day, or around $30 time four days. The slight extra cost was worth not dragging my clubs on trains and planes before getting to Crail. Speaking of the flight to Edinburgh, the discount carrier Norwegian Airlines is now flying from Hartford, CT’s Bradley International Airport, just 35 minutes from my home. And to spur folks to use its service, the airline has offered flights to Scotland for as low as $99; I scored one of those but, of course, one checked bag and a meal are $75 extra, and the return flight is around $275. Still, for an overseas flight, that’s a bargain. Norwegian is flying from a number of U.S. airports so if you are planning a golf vacation in Scotland, it makes sense to check if Norwegian Airlines has set up shop near you. And check out LuggageForward.com to make life and travel a lot easier on yourself. There was plenty to do on site, including a smallish but professionally outfitted fitness center, organized activities like beach volleyball and baseball, and a horseshoe pit and bocce court, although urban lovers of bocce will find it strange to throw the balls on the soft sand rather than roll them on a legitimate bocce surface, but no one seemed to care. Some might complain about the two feet wide stretch of seaweed -- actually more like sea kelp -- that washes up onto the beach and also bounces around in the first few feet of water before you step into a clear blue (warm) sea. We thought the seaweed issue was much ado about nothing. All in all, though, this is a great way to pack away all your cares and woes for a week. The three golf courses we played ranged from fun to more fun to tons of fun with relentlessly drop-dead gorgeous views of the ocean and cliffs. I'll let the photos below speak for themselves, except for some brief notes that follow. 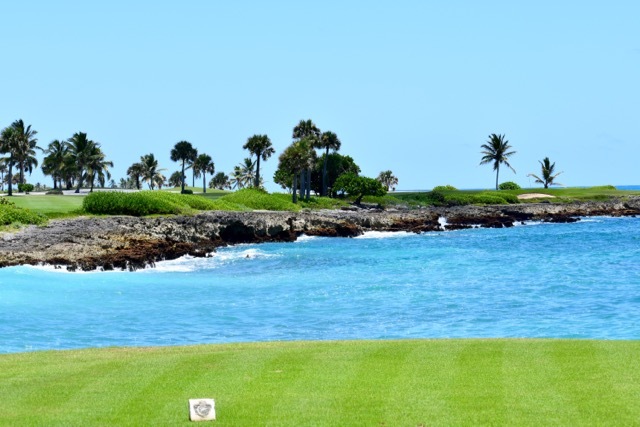 This was a great layout for a warmup round since water was fairly easy to circumvent on the first nine, the Hacienda course, but was both a visual and hazardous presence on the Arrecife nine, especially the last few holes along the ocean. (We did not play the Tortuga nine, which seems to have the strongest presence of sand and a couple of holes with close views of the ocean.). We noted that greens on all the golf courses we played were not cut for speed in fear that the hot summer sun would wreck havoc on the grass. So they were much slower than they would be in season, in winter. Some of the ocean views showed the bluest water I have ever seen this side of a Disney cartoon. The water just off La Cana Golf Club in Punta Cana, Dominican Republic, was the bluest I had ever seen. 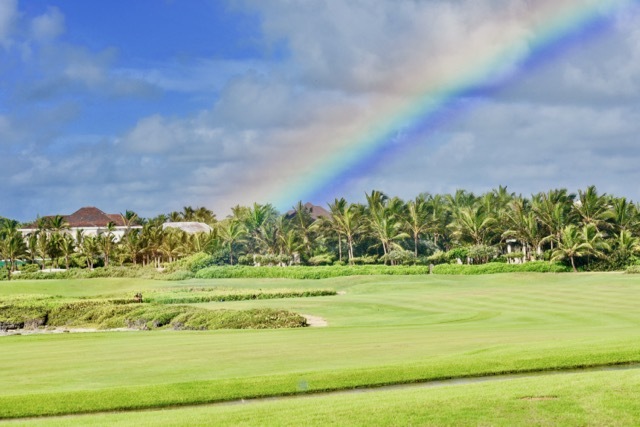 Corales has scored a major coup by landing a PGA tour event next March, the Corales Puntacana Resort & Club Championship. As you leave the airport in Punta Cana, you pass a billboard promoting the event and featuring a huge photo of PGA star Jim Furyk. 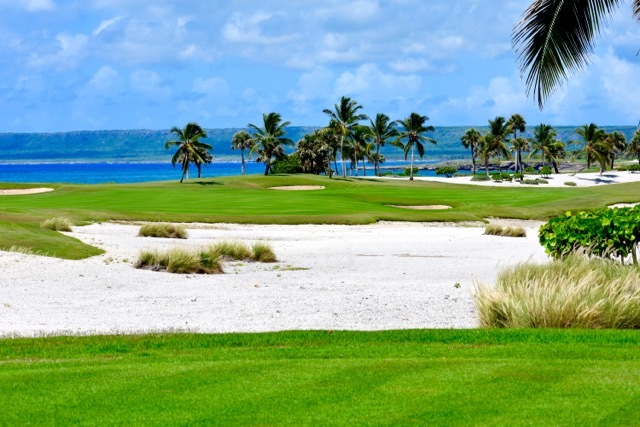 The Tom Fazio-designed Corales should be a worthy test of the pros' shotmaking abilities, given the championship tees are set at 7,670 yards and sand and water hazards abound. 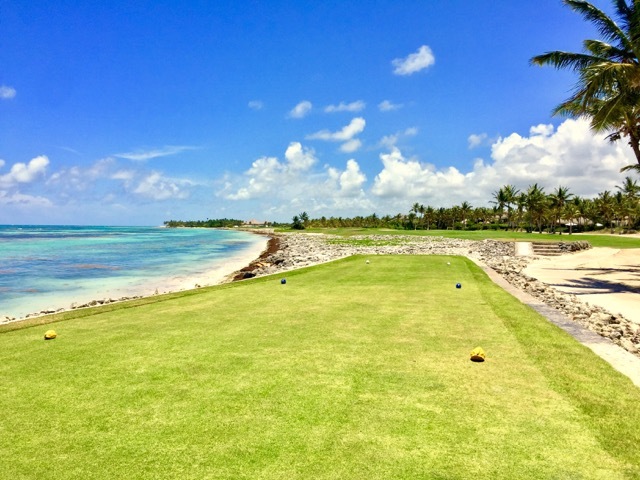 The ocean views from the three finishing holes, as at La Cana, showed unnaturally blue and green waters. TV coverage of the first PGA Tour event in the Dominican Republic should be a lot of fun to watch. 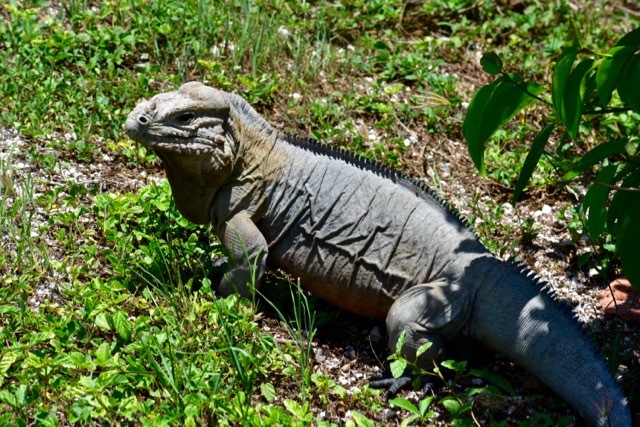 You know you are likely to have a good day on the golf course when you see something like this just before tee time at Corales Golf Club in Punta Cana. Even the holes at Corales that don't abut the ocean still manage to get your attention. 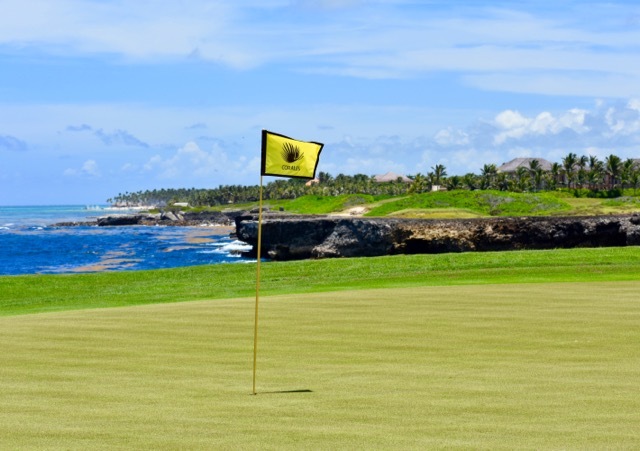 The finishing hole at Corales, a par 4, is played over the deep blue sea and then to a smallish green perched above the cliff. It should be fun to watch the PGA competitors finish their rounds there next March. We saved the best for last with a goodbye round at Jack Nicklaus' Punta Espada, rated by most followers of Caribbean golf as the best in the islands. I believe it as the course doesn't come close to having a clunker of a hole and it is drop dead beautiful from the first tee to the 18th green (especially the 18th green, which is perched over the brilliant blue waters on the ocean below). Indeed, eight holes play along the ocean and few others are within site, the golf course sitting pretty much above the water at most points. The final three holes may be the most visual anywhere this side of the Irish and Scottish coasts, with the ocean directly behind the long par 3 16th and beside the 17th and 18th, two par 4s that will test your patience and ability to negotiate the fickle ocean breezes. Punta Espada is expensive but I would say worth every penny. And, what the heck, you'll be on vacation. However, if you want to stay forever, most homes are priced above $1 million. 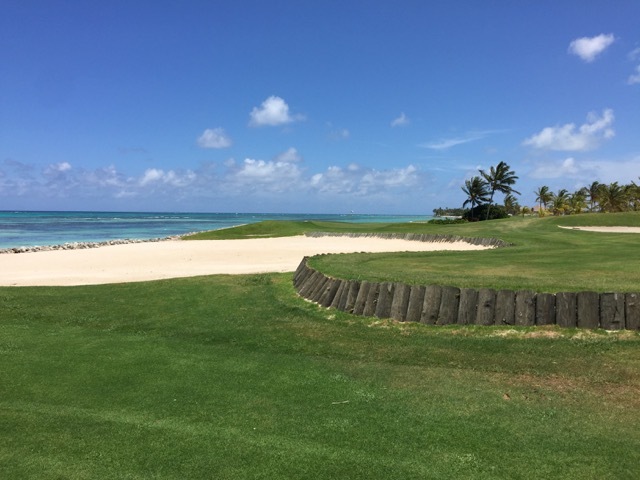 In one view, Jack Nicklaus captures every element -- sand, sea, palm trees -- that exemplify Caribbean golf. 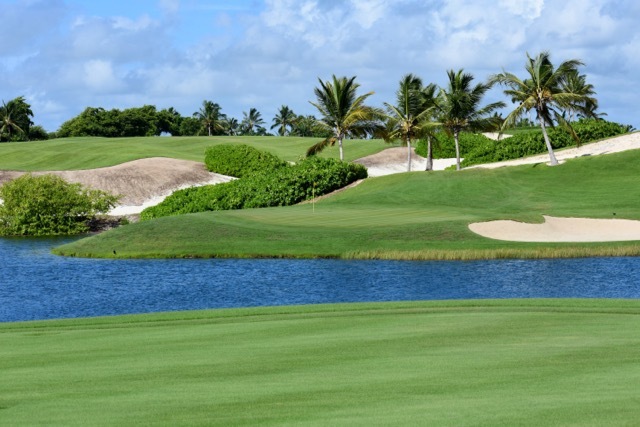 An almost-finished second 18 at Punta Espada is called Iguana, although we saw a few on the finished 18.